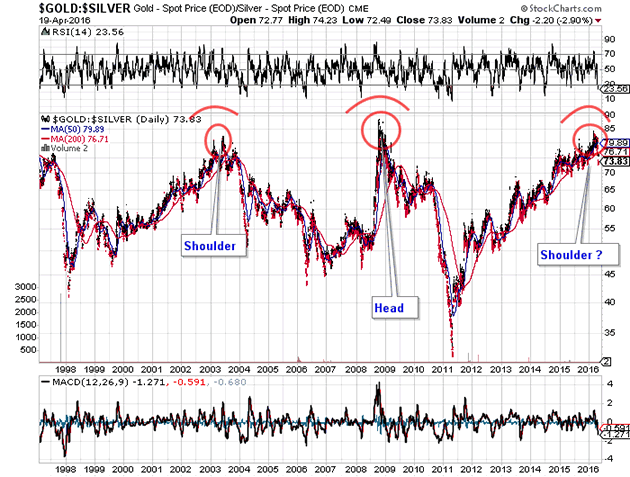 Precious metals expert Michael Ballanger examines silver's recent moves upward. In my business, there is a great deal of travel, be it to properties in the Peruvian Andes or the Canadian Yukon or to the investment conferences in New Orleans or San Francisco or London, so I get a full psychographic cross section of every type of investor imaginable. First of all, the audiences I have encountered at the "Sound Money" conferences in Nassau or Bermuda are usually quite conservative and usually well-dressed and well-groomed. When the topic is gold and it is a controversial speaker looking for "the end of Western civilization," the audiences tend to be a tad different with hair length and dress code noticeably more avant-garde. However, when the topic is confined to silver, while the speakers tend to be "evangelical," the audiences appear to be (operative word being "appear") simply stark-raving madmen of the first order. They usually dress in military fatigues, the males are all in ponytails, the women weigh more than the men, and the T-shirts and baseball caps on both males and females carry logos from either the WWF or the Monster Truck conventions. However, they are usually quite erudite when discussing "survival techniques"; they are usually extremely well educated and they are all able to rhyme off the silver production numbers for the past 20 years BY COUNTRY; and most importantly, they carry high distain for anyone who fails to know these facts. These are simply goldbugs amped up on argentine steroids, and I happen to have an extremely high regard for them, as they represent the fringe of the movement. The silver bugs would charge the Federal Reserve Building in a New York minute; they would canonize WikiLeaks founder Julian Assange if allowed; they would vote for Ron Paul 40 years after his passing; and they wear Edward Snowdon T-shirts around the local shopping mart. They can usually recite the Declaration of Independence in its entirety and consider themselves true patriots. They view silver as the only "real money" on the planet and normally hold over half of their net worth outside of the banking system in the form of silver, while residing in remote parts of Idaho or Wyoming, usually in the mountains. When I have given speeches or lectures over the years, I can usually pick them out in a crowd; they rarely smile and NEVER laugh at anything I have said (which may or may not be seen as abnormal). Now, you will of course forgive the stereotyping, but that is simply and purely my blanket view of silver bugs. As we discussed back in late March, shorting the GTSR (Gold-to-Silver Ratio) at 80 looked like it could turn out to be the 2016 Trade-of-the-Year, but little did I expect that the move would occur without a breakout (or breakdown) move in gold. As it stands, gold is still locked in that $1,210-$1,287 range that has shackled it since the 1st of April, but silver by contrast has been a standout performer since that day. The new recovery high seen today in silver is a big positive over the near term and bodes well for the ultimate test of $18.50, with a strong likelihood that silver is leading gold to what will be an upside resolution to this sideways correction. To coin a phrase, "There's no fever like GOLD fever," but even better is "There's no mania like silver mania," and now that silver appears to have finally shed the bullion bank shackles, it could easily see the low $20s within a few months. I was thinking of buying a fistful of long-dated calls on Pan American Silver Corp. (PAA:TSX; PAAS:NASDAQ), but I decided to buy only a few while instead putting more of the cash into a private junior silver company called Santa Rosa Silver Mining Corp. (at $.05 per share). In that time frame, Pan American Silver had advanced from $10.82 to $14.00 with the July $10 calls advancing from $1.65 to $4.00, so as much as I fashion myself as a metals expert, I should have opened up the wallet and bought the Pan American calls as well. Leaving better than a double on the table hurts despite the fact that the GDXJ (Market Vectors Junior Gold Miners) position has better than doubled since Jan. 19. 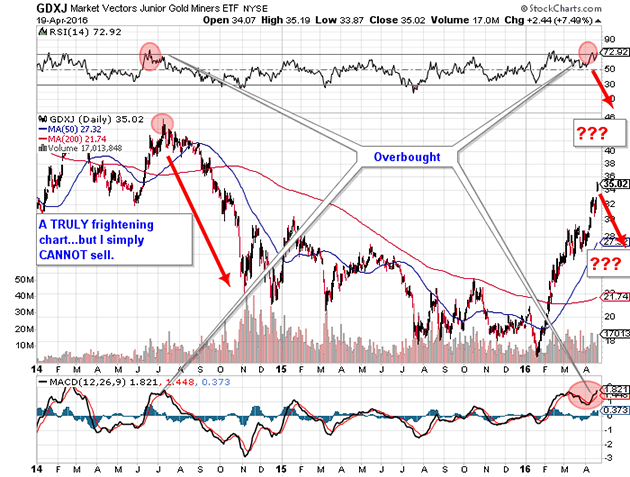 The GDXJ has been on one wicked tear since mid-January and, while we all know how ridiculously undervalued the miners became in the latter half of 2015 and early 2016, RSI (Relative Strength Index) readings above 70 have always been associated with tops in any and all markets that I have followed. 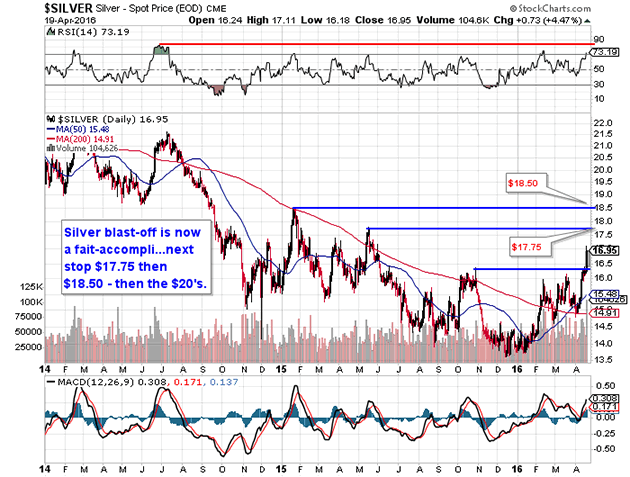 Accordingly, I should be taking profits in the GDXJ, but I have decided to refrain and ride the trend instead. It may be madness and it may be greed, but I simply MUST hang on for dear life and pray that the golden bull doesn't throw me into the ditch and my net worth with it. With silver up another 1.17% this morning, I feel like Robert Duval in "Apocalypse Now" because "I just LOVE the smell of incinerated silver shorts in the morning. . ." As I wrote about back in December with gold starting to rally, it feels different these days and silver feels as though it will be in the $20s sooner than one might imagine. 1) Michael Ballanger: I or my family own shares of the following companies mentioned in this interview: Pan American Silver Corp. and Santa Rosa Silver Mining Corp. I determined which companies would be included in this article based on my research and understanding of the sector. Statement and opinions expressed are the opinions of Michael Ballanger and not of Streetwise Reports or its officers. Michael Ballanger is wholly responsible for the validity of the statements. Streetwise Reports was not involved in any aspect of the article preparation or editing so the author could speak independently about the sector. Michael Ballanger was not paid by Streetwise Reports LLC for this article. Streetwise Reports was not paid by the author to publish or syndicate this article.